Maybe it’s our lifestyle – we’re always busy, busy, busy! But the latest craze in jewelry lately for us at Scott’s Custom Jewelers has been motion jewelry. These cool pieces – rings mainly – have moving parts. 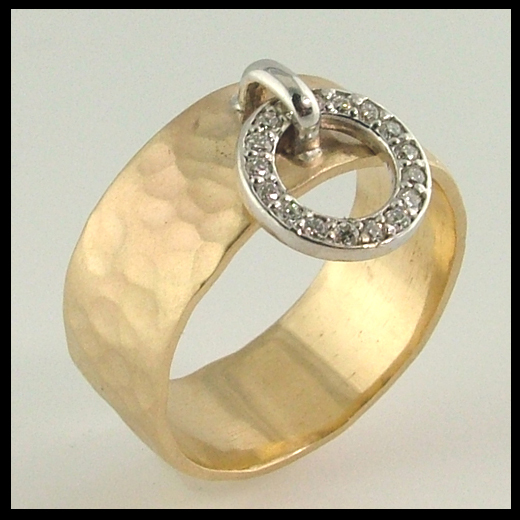 They flip, spin, twist and turn, exposing smooth, polished metal sides and sparkly, shiny diamonds on the other. Some do a whole bunch of moves, others may only slide back and forth. But all of them are like toys for your hands. The 14k hammered gold ring pictured above has a circle of diamonds that flips and spins. We made it for a stock piece in our Akron, Ohio store, and in a few weeks, have sold two customized versions of this style. One woman saw it and immediately wanted it as a wedding ring. Her future husband has a young son, and her custom ring is going to have one ruby, her stepson’s birthstone, mixed into the diamond circle. A couple of days later, another woman fell in love with the same design, only she is having her three children and four grandchildren’s birthstones set into the circle. A truly custom mother’s ring. Motion jewelry. Fidget jewelry. Worry beads. Whatever the name, playing with rocks suddenly became fun again!